We are excited that LinkedIn has opened its API to allow items to be posted to any company page that you manage. Items are posted to a company page in the same way that they can be posted to a profile or group. First, you must define a new network connection to the page. Click the Connect to a Company Page button. If this is your first time making this connection, you will see a pop-up window provided by LinkedIn that will ask you to login to your LinkedIn account and grant the listed permissions. Once this step is completed, a list of the Company Pages that you manage will be displayed. Select the page and then click Confirm to complete the connection. You can now post items to your company page in the same way items are posted to other types of networks. Just select the network from the list when posting an item. This feature will help you discover new RSS feeds on the web that pertain to your favorite topics. You can search for keywords found in the RSS feeds from blogs, news websites, podcasts and more. The top 10 matching feeds will be returned. You can then view any of the content from these feeds, or set the feed as an RSS Feed Source with one click. The main difference between locating content with an RSS Search vs. a Google or Bing search is that this search is specifically looking for valid RSS content feeds and not web pages. Once feeds are located, you can then click to view the full feed and pick content from there. To add an RSS Search Source, click the icon in the button bar (under the View Sources tab). You will then be asked for a search term that will be used to find the appropriate feeds. To view the items contained in any feed, click the View the Feed button. A pop-up will appear containing the items provided in the feed. If it is possible to retrieve more items, you will see a small arrow icon at the top of the feed that you can click. To select and publish any item from the feed, click the Select button. If you like the content of a particular feed and would like to use it as a regular source of content, click the Set as Source button. This will immediately take this RSS feed and create a new RSS Feed Source that will appear in your dashboard. This feature let’s you refine who will see the items you post to your Facebook Page through a particular network connection. For instance, you can target fans in California with one message and fans in New York with another. The fans in New York would not see the message targeted for California and vice versa. If you plan to post content to different types of audiences, it is possible to define more than one Facebook connection to the same page, but with different targeting parameters. Content targeting is defined through the setup of each Facebook network. These options can be set when you edit an existing Facebook connection. There are two different types of content targeting that are provided by Facebook: Limit Your Audience and Feed Targeting. The method you end up using is decided by the type of targeting parameters you specify. For example, you are “Limiting Your Audience” if you are targeting people by country, region, city or language spoken and you are “Feed Targeting” if you are targeting people by gender or relationship status. When you choose one of the options for limiting your audience, your page post will only show up in the News Feed or on your Page for people in the location(s) you choose or for people who speak the language(s) you specify. Even if people share your Page’s post with their friends, only friends in the audience you choose for the post will be able to see it. A targeting location is specified by selecting a country, and then a region or the name of a city within that country. To select a country, start typing the name of the country (slowly). You should see a list appear of the valid country names that match what you have started to type. Select the country from this list and then it will appear as a tag within the selection field. You can then start typing additional country names to add them to the list. If you select a single country, you will then be able to select a specific region within that country OR a city from that country (you can cannot select using both). To make this selection, click into the Region field and start typing or choose a region from the drop-down list that appears. For instance, if you select United States as the country, you can pick one or more States from the region list. If you select Canada, you can pick one or more Provinces from the list. Alternatively, you can specify one or more cities that you would like to target. To select a city, start typing the name into the City field. You should see a list of the valid city names that match what you have started to type. Select the city from this list and then it will appear as a tag within the field. You can then start typing additional city names to add them to the list. To remove a selection, move the cursor to the end of the tag and press Backspace to clear it. You may also want to target content by the language that people speak. For example, to target Spanish speakers, click into the Language(s) field and start typing Spanish. Select Spanish from the drop down list to make your selection. Then, only people who speak spanish will see the items you post to this network. 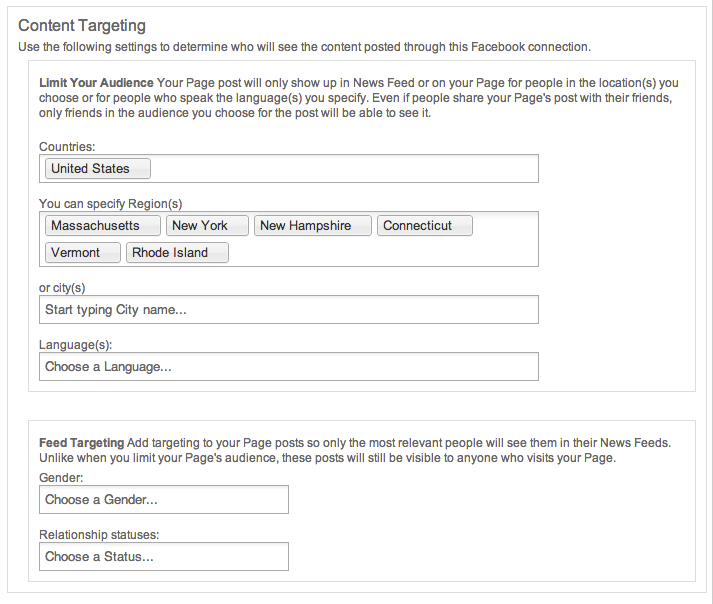 You can target your posts by gender or relationship status using Feed Targeting. to your posts These items will be displayed in News Feeds to only the people that match the criteria. However, unlike limiting your audience, these posts will still be visible to anyone who visits your Page regardless of their gender or relationship status. To specify a Gender or Relationship Status, click into the field and you will see a drop-down list of possible settings.